As a Food Stylist and Editor at allrecipes.com I get many unique opportunities to work on projects I would not tackle in my own kitchen. Sure, there are a share of casseroles, slow cooker mashed potatoes, and dips. But then, there’s is also TURDUCKEN!!! The infamous Thanksgiving delicacy that combines turkey, duck, and chicken! Have you had a chance to prepare or taste this? With the help of Bill the Butcher, we received all three birds, artfully prepared (boned and properly fabricated) and ready to be layered. That’s right, rather than stuffing the birds one inside the other, they are layered on top of one another with delicious stuffing in between. We, of course, used the allrecipes.com recipe for Sausage and Oyster Stuffing (feel free to use your favorite recipe). 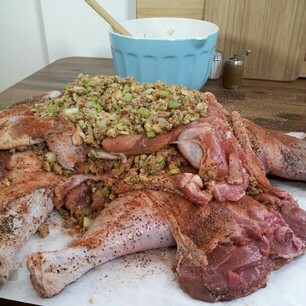 When it comes to preparing the turducken, I would recommend having more than one set of hands and lots of patience. No squeemish folk here! The birds don’t look the most attractive, but trust me when I say – the effort is well worth it! Another suggestion – remove the skin from the duck and the chicken – you can easily do it yourself or ask your friendly butcher for help. You ready for your own turducken? 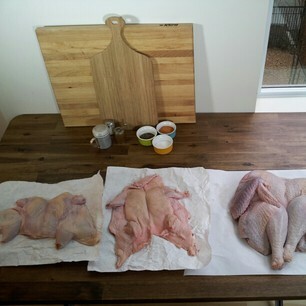 Check out this video we made with allrecipes.com! 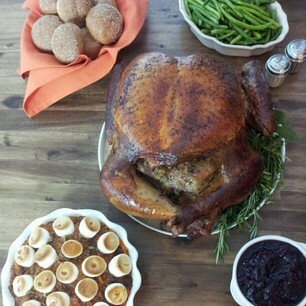 Happy Thanksgiving from Snacking in the Kitchen!